Kumpulan Cerita Binatang Singkat dalam Bahasa Inggris - Salah satu cerita yang banyak dicari baik itu untuk belajar maupun hiburan adalah cerita tentang binatang, selain dalam bahasa kita juga banyak di cari dalam bahasa Inggris. Kali ini, edisi cerita dua bahasa akan dikhususkan untuk membahas mengenai cerita tersebut. Anda bisa membaca banyak cerita binatang singkat yang akan dibagikan, mau? Sebelum terlalu jauh ke ceritanya, kembali saya mengingatkan bahwa untuk anda yang membutuhkan cerita dalam dua bahasa bisa menggunakan terjemahan dari google. Jika membaca cerita bahasa Indonesia bisa diterjemahkan langsung ke bahasa Inggris dan sebaliknya jika ceritanya bahasa Inggris maka tinggal terjemahkan ke bahasa Indonesia. Tombol terjemahannya ada di sisi kanan atas website ini. Jadi, meski pun tidak ditampilkan langsung cerita dalam dua bahasa anda tetap bisa menggunakan terjemahan tersebut sebagai alternatif. Cukup mudah bukan? Untuk anda yang membutuhkan banyak cerita yang khusus tentang binatang maka anda bisa mendapatkannya pada koleksi yang akan diberikan. Koleksi ini akan terdiri dari berbagai jenis cerita khususnya dengan tema hewan. Jika saat anda membaca tulisan ini beberapa link di bawah belum aktif maka kami mohon maaf yang sebesar-besarnya karena mungkin cerita yang anda butuhkan tersebut sedang dalam proses upload. Untuk membagikan berbagai cerita tersebut tidaklah gampang, jadi bagi anda yang ingin membantu anda bisa berpartisipasi dengan membagikan berbagai koleksi cerita terbaru yang ada di media sosial yang anda miliki. Satu persatu cerita terbaru di atas akan dibagikan untuk anda, jadi pastikan anda selalu berkunjung ke website ini untuk mendapatkan berbagai bacaan yang anda inginkan. Selanjutnya anda bisa juga langsung menikmati beberapa alur kisah yang sudah di siapkan di bawah ini. Lumayan bukan, nah jika anda berminat anda bisa langsung membacanya di bagian bawah. Atau anda bisa juga mencatat atau mencetak kisah yang anda inginkan. Cerita tersebut selengkapnya di bawah ini. An ant nimbly running in search of food came across a chrysalis that was close to its time of change. The chrysalis moved and this attracted the attention of the ant, who for the first time realized that it was a living thing. "Poor, pitiable animal!" cried the ant disdainfully, "what a sad fate yours is! While I can run around at my pleasure, you lie imprisoned in your shell." The chrysalis heard all this, but did not respond. 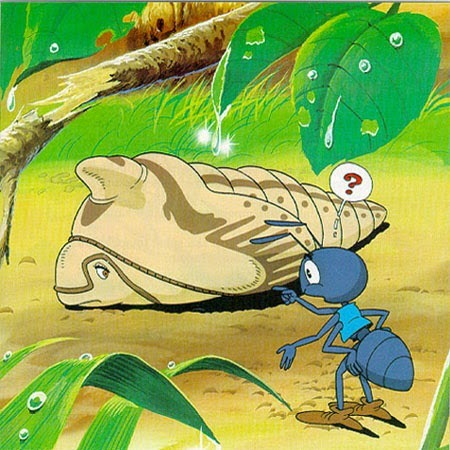 After a few days, when the ant passed the same way, nothing but the shell remained. Wondering what had happened to its content, the ant felt itselfsuddenly shaded and fanned by the gorgeous wings of a beautiful butterfly. "Behold in me," said the butterfly, "your much pitied friend!" So the butterfly rose in the air and was lost in the summer breeze. Tom and Adam were close friends. They always did everything together. One day, they had a walk in the woods. Tom and Adam were very happy. They enjoyed walking in the woods very much. After walking for several hours, they got tired. Adam agreed. They took a rest under a big tree. Adam was so tired that soon he fell asleep. Suddenly, Tom saw a bear came out of the bushes. He was terrified. He quickly climbed up the tree and left Adam alone. The bear came closer. It sniffed Adam's face. Adam woke up and was very shocked to know that a bear was sniffing his ear. He was stiffed and could not move. “I'm going to die. It's going to kill me,” he thought. He was lying on the ground quietly. After a few seconds, the bear moved away. It disappeared to the bushes. After that, Adam hurriedly climbing down the tree and approached Tom. Tom opened his eyes. He was surprised to see that the bear didn't hurt Adam. He asked Adam, "What did the bear whisper to your ears?" Adam frowned and he said angrily, "The bear told me that a person who thinks only of himself cannot be a good friend." Once upon a time, there was a man who had captured a polar bearwhich he intended to present to the tsar. On the way home, he found himself in the woods as night began to fall, and he asked a woodsman for refuge. The man laid out his bed in the closet, and the bear crawled in under the covers and soon fell asleep. Teat evening the trolls arrived, hundreds of every shape and size, noisy and cheeky like little boys. One of them spied the white fur under the covers, and thought a large cat was hiding there. The troll tugged spitefully at the fur, until the polar bear leapt out in fury. The terrified trolls fled. The year after, before turning up at the house, the trolls asked the woodsman if he still had his “big cat”. Needless to say, the trolls never returned to the woodsman's house for their banquet. Arion was one of the most famous singers in the ancient world. On one occasion he won an important festival Sicily, and as his prize he received so many jewels and golden cups that he was obliged to hire a ship to carry them all home to Corinth. Unfortunately, this huge treasure madethe sailors very jealous, and in order to have it for themselves, they attacked the singer and were about to throw him overboard. Arion did not put up a struggle, instead he asked only that he be allowed to sing one last song. His wish was granted and the sailors were so enchanted by his voice that they were hardly aware of what happened next. At the first notes of his song, a dolphin swam alongside, attracted by the beautiful music. Immediately Arion jumped overboard onto the dolphin's back and was carried back across the sea. When the ship finally reached port in Corinth, the wicked sailors began to tell everyone that there had been a storm, during which the famous singer had been lost at sea. They were struck dumb with amazement, however, when Arion arrived with a company of soldiers to arrest them. In memory of this event, a statue of a young man on the back of a dolphin, was erected in the port of Corinth. This statue is still there today. There once was a Jackal who hated water but needed to cross a river. He decided to come to an agreement with a camel. The camel agreed to this bargain and the Jackal jumped up on his back. The crossing went perfectly, but after­wards the jackal who had a much smaller stomach, satisfied his hunger long before the camel. Whilst the camel was still eating, the jackal began to howl. The noise brought the farmers running with big stick. The little jackal managed to escape, but the camel could not avoid a beating. “Why on earth did you do that?” asked the camel when he was carrying the jackal back across the river. “Oh, it's just that I nearly always sing for a while after dinner,” replied the jackal. “Well, I nearly always have a roll in the water when I've finished eating,” said the camel, and he splashed down in the river. So with a ducking in the river, the camel repaid the jackal for the beating it had received. Once, a farmer owned a donkey and a lapdog. The donkey worked hard all day, hauling heavy loads. The lapdog stayed with its master all day and lived in the house with him. It did not work, but was allowed to sit on its master's lap. The donkey grew jealous of the lapdog. "Perhaps if I behave like the dog, like wag my tail and jump on the master, the master will start loving me as much as he does the dog." So the donkey waited for its chance. One day, when it was left unattended, the donkey broke its halter and ran into the farmhouse kitchen, where the farmer sat at the table. The donkey rushed up to him and began wagging its tail vigorously and knocked off all the things on the table. It then started jumping around and frolicking like a little dog and finally, plunked itself down on the farmer's lap. The shocked farmer yelled for help. The farmhands came running in and dragged the donkey off to its stable and gave it a beating it would never forget for the rest of its life. The bees and the hornets were in dispute, because both claimed that they were owners of the honey In a honeycomb. Since they simply could not come to an agreement, they all ended up in the court-room. There, the judge, a wasp, found it impossible to decide who was In the right. There were witnesses who declared that they had seen black and yellow insects going in and out of the comb, but this testimony did nothing to clarify the situation, as both bees and hornets are black and yellow insects. The wasp was obliged to make further enquiries and ask many questions, it seemed that the proceedings would go on forever until the Queen Bee finally lost her patience. A scorpion and a tortoise became best friends and they took a vow that they would never be separated. So, when one of them was obliged to leave his native land, the other promised to go with him. One day, they have to travel outside their village. When they had traveled only a short distance, hey came to a wide river. The scorpion was now in great trouble. "Alas," he said, "You, my friend, can easily swim, but how can a poor scorpion like me ever get across this stream?" "Never fear," replied the tortoise. "Just place yourself on my broad back and I will carry you safely." Then, the scorpion settled on the tortoise's broad back, and then the tortoise crawled into the water and began to swim. Halfway across, he was startled by a strange rapping on his back, which made him ask the scorpion what he was doing. "I am whetting my sting to see if it is pos­sible to pierce your hard shell, "answered the scorpion. "Ungrateful friend," said the tortoise. "You know very well that I have power to both save myself and punish you as you deserve." And then he sank his back below the surface and shook off the scorpion into the water. Besar harapan kami bahwa Kumpulan Cerita Binatang Singkat dalam Bahasa Inggris ini bisa bermanfaat baik sebagai sarana hiburan maupun sarana belajar bagi anda semua. Jangan lupa catat alamat website ini sebagai tambahan referensi. Sekian, silahkan dilanjut dengan beberapa kisah di bawah ini.